Sometimes it’s those indie games that have the most clever of mechanics, taking styles that we’re used to and turning them on their head. 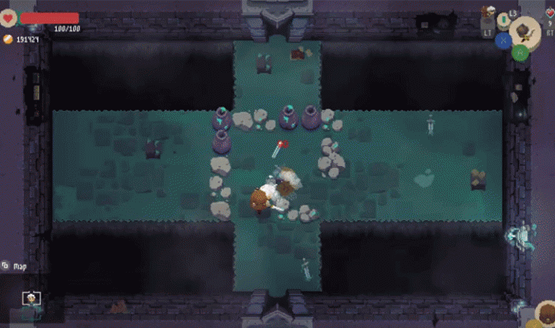 Moonlighter looks like a Zelda-inspired dungeon crawler at a glance, and that’s not an incorrect assessment. There is definitely an element of dungeon crawling in the classic Zelda style, that top-down view where you can see the walls of each room of the dungeons you enter. 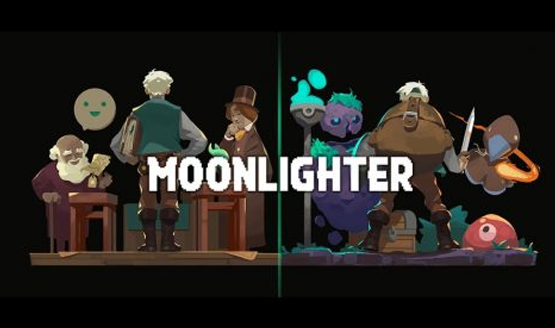 The surprise for Moonlighter comes when you get outside the dungeon. The hero of Moonlighter is only moonlighting as a hero (hence the name). During the day, he’s a merchant, a shopkeeper that owns a store in town. The two jobs go hand in hand. As a hero, you’ll collect items that can be used to upgrade and craft new gear, or can be sold at your store to try and turn a profit. During your time at the store, you set the items out as well as setting the prices, which can either come across as too cheap or will turn your customers away as they find your products too expensive. In my preview session at E3 2017 I had a chance to fight my way through a couple of dungeons and play around with the shop economics. It’s quite fun to set out various products and actively change the prices, seeking that sweet spot that isn’t so pricey that it leaves your customers sad, but isn’t so cheap that you are selling yourself short and losing out on profit you could be making. There’s a deep strategy to this system because you need to figure out what’s worth selling and what’s worth just keeping for your own use. The dungeon crawler portion does get quite difficult very quickly, and it seems like there will be quite a bit of grinding to earn better and better gear, through either sales in your shop or crafting your own gear. That grind isn’t a bad thing at all. That’s the hook of the Moonlighter and something that will drive your next foray into the dungeon. Apparently there’s a pretty deep and changing economics system underneath everything which will be impacted by things like supply and demand, and your shop can be continuously upgraded to give bonuses and help you succeed more and more. In many ways, I had more fun behind the counter in my shop than I did running through dungeons. I’m very happy that the two systems intertwine in such a way that there’s always a compelling reason to move forward. Maybe you need to gather a little bit more money to earn that new weapon? You may venture into the dungeon to gather resources to sell or you may see what you already have in your inventory to place in your shop. The constant gameplay loop was fascinating. You aren’t the hero. You’re a regular guy, and Moonlighter is a fascinating look at how those shopkeepers might actually acquire the things we’re buying from them in any other dungeon crawler. Moonlighter releases 2017 for PS4, Xbox One, and PC. Check out all of our E3 2017 coverage.